Sheffield based Phoenix Steels Ltd relies heavily on Moore & Wright micrometers from Bowers Group to meet high levels of quality and accuracy of their ground flat stock. 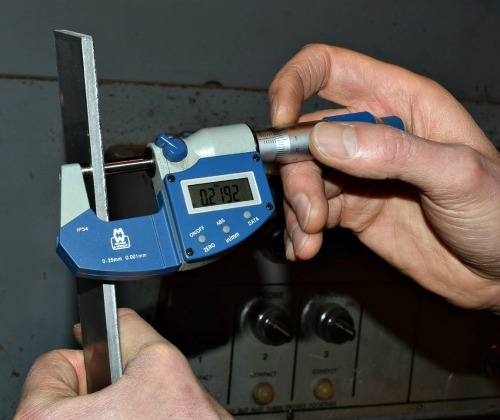 The family run business has been supplying quality tool room steels directly to the precision engineering and manufacturing industry for more than 25 years, and use the micrometers on a daily basis. Until recently, Phoenix Steels relied on a traditional Moore & Wright micrometre that was at least 30 years old. Although this model was still working well for them, Bowers has supplied the company with a brand new Moore & Wright digital external micrometer with a large LCD display, as well as a Moore & Wright workshop digital caliper. Phoenix Steels is involved in the day-to-day processing of all popular grades of tool steels, including the manufacture of ground flat stock. In addition, the company also supplies and stocks key steel and silver steel, along with O1 , D2, H13 , P20, M2, and 1.2767, bar from its 8000sq ft warehouse in the centre of Sheffield. They also stock and supply O1 sheet from 2.4mm thick up to 6mm which can be cropped and precision roller flattened to customer specifications. Micrometers are used to measure the sheet prior to the cutting and roller flattening process, giving the surface grinding machine operators an accurate measurement of the starting size of the steel. After the grinding process, during which various sizes of ground flat stock are produced, micrometers are used again to check that the finished product is within tolerance. Phoenix Steels manufactures and stocks a full range of standard metric and imperial sizes, and tolerances are typically tight; +/- 0.001 inch or – nil + 0.05mm. Tolerances for finished products are industry standard for ground flat stock, and as long as these standards are met with accuracy they can be passed for sale. The company has an in house grinding facility to ensure speedy, small batch production in order to keep the stock programme up to date. Phoenix Steels’ supply of ground flat stock is predominantly used in tool making, as well in the making of knives, punches, jigs and fixtures. The company is also well equipped to produce special sizes for the bespoke requirements of customers; whether these are individual pieces, small batch, or full production quantities of ground flat stock or pre-machined bar.